Doctor Who may have had his narrowest escape yet. In a special Christmas adventure, he nearly gets a new assistant: the comedienne Catherine Tate. As the woman behind stroppy teenager Lauren - catchphrase Am I bovvered - she'd have made a highly unconventional partner for the Doctor. Breakfast's Arts Correspondent Emma Jones went to meet the cast. "The Doctor's used to his companions being rather grateful for their ride in the Tardis, " David Tennant told us. "But Donna (Catherine Tate) couldn't be less interested - which is an interesting new dynamic." The Christmas special also stars Sarah Parish, from Cutting It, who's almost unrecognisable as a giant spider. Make-up and costume for the role took four hours - and computer-generated eyes have been added, which blink at the same time as her real eyes. After Christmas, the Doctor's next adventure in the new year will be with his new assistant, Freema Agyeman. 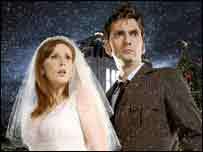 The Runaway Bride is on BBC One at 7pm on Christmas Day.